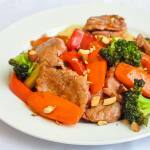 Stir Fried Chinese Pork Tenderloin - a great quick & easy, basic recipe. Stir Fried Chinese Pork Tenderloin. A good quick & easy, basic recipe to use with available supermarket bottled sauces like Hoisin, Blackbean, Char Siu and Oyster. As much as I like cooking and spending time in the kitchen, I still love a good quick meal like this Stir Fried Chinese Pork Tenderloin . This one makes good use of pork tenderloin cut in thin coins for fast cooking and some delicious Chinese Char Siu Sauce, which is sometimes referred to as Chinese Barbecue Sauce. If you are confused about using those bottled sauces in the Chinese Food aisle this basic recipe is a good place to try them and see which you will like. Hoisin sauce is probably the safest bet for a balanced sweet and slightly tangy flavour. This is also a good basic recipe to use with other bottled sauces in the Supermarket Chinese food aisle. Hoisin Sauce or Black Bean Sauce will work equally well. Another favourite idea, if you like it, is to mix a little oyster sauce with one of those other suggested sauces for even deeper, more complex flavour. For our family, this is an ideal busy weekday dinner. If you steam the carrots and broccoli while you stir fry the pork medallions you can easily have this one on the table in 20 minutes or so. 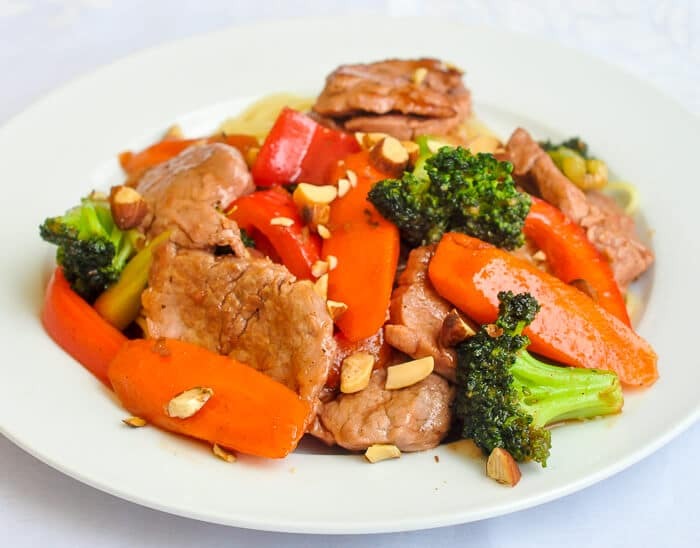 Like this Stir Fried Chinese Pork Tenderloin recipe? You’ll find hundreds of other great ideas in our Quick & Easy Dinners Category and even more in our Pork Recipes Category. Originally published July13 2010. Recipe updated, nutritional values & print button added November 2017. 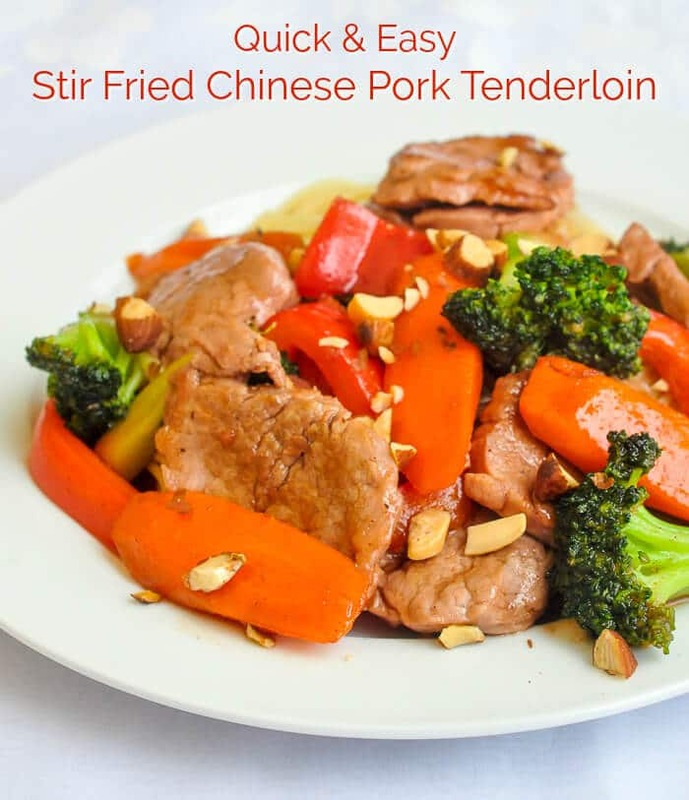 Stir Fried Chinese Pork Tenderloin - a good quick & easy, basic recipe to use with available supermarket bottled sauces like Hoisin, Black Bean, Char Siu and Oyster. Steam the carrots and broccoli in salted water until just under fork tender. Drain and immediately drop the steamed vegetables into a large bowl of ice water to stop the cooking action. Drain and set aside. Cut the pork tenderloin in thin slices. Lightly season the pork with salt and pepper. Add the oil to a very hot wok and quickly stir fry the pork slices for only a few minutes. Remove them from the wok and set aside. Reduce the heat on the wok to medium high and sauté the garlic for a minute. Add the remaining ingredients for the sauce simmering for only a couple of minutes. Turn the heat back up to high. return the pork and steamed vegetables to the wok and toss together for a few minutes until everything is well heated. Serve over rice or Chinese noodles and garnish with toasted almonds, cashews or sesame seeds. what is that sauce char siu and where is it available or can something else be used. recipe sounds like it would be tasty. Did you read the full post?